It feels like it’s been way too long since I posted anything. Please excuse me—it’s Ramadan so I’ve been totally focusing on that. If you don’t know, the month of Ramadan (based on the lunar calendar) is a time where every Muslim in the world fasts for 30 days. It doesn’t mean we don’t eat for 30 days, it just means we rearrange our whole lives to take extra time to think, pray, reflect, appreciate, and be grateful for what God (Allah) has given us.. It’s an entire month to ask for forgiveness, learn about slef control and become a better human being spiritually, physically, and emotionally. Ramadan is truly a unique month. Every morning we wake up around 3:30 am and we eat suhoor, (breakfast) while it’s still dark out. Usually for me it’s dates, LOTS of water to last me all day, maybe some tomato/lentil soup, and maybe some leftover food from dinner. When the athan, the call to prayer, sounds around 4:15am (it varies and gets pushed back about a minute or so every 2 days, due to the earth’s rotation) it’s everyone’s cue to drop whatever you’re eating or drinking. Like seriously, drop your fork. Then we wash up and do our wudu, our precise method of washing our hands, mouth, nose, face, wrist-to-elbows, hair, inside & outside of ears, and finally our toes and feet. When this is done, we are ready to pray. The morning prayer is called fajr and it is always done before the sun comes up. During Ramadan, we pray and then afterwards Mohamed and I read the Quran for a while before we go to sleep around 5:30-6ish. Since I don’t work, I have the luxury of sleeping in till about noon. When you think about it, sleeping from about 1:30am-3:30am and waking up for breakfast is not really solid sleep. In fact, since I’m up for a good two hours, I think it negates the sleep before breakfast. So if I sleep from 6-noon, it’s really not that long. It’s like going to sleep at 11pm and then waking up at 5am for the day. Totes not lazy. Mohamed may not agree with that. He gets up at about 9:00 am (sometimes earlier) and heads to work. Just because it’s Ramadan and people are fasting, doesn’t mean that he gets the whole month off. Nope. He’s out there in the hot sun doing hard work and when he’s inside he’s doing really heavy lifting. He’s a butcher so sometimes he’s literally luggin’ around cows and goats and stuff. Soooo not my thing. …but sleeping in is. When I finally roll out of bed couch, I start my day and then around 12:45pm the athan goes off again, signaling that it’s time for dhohr, the afternoon prayer. It’s time for wudu again and then I’m ready to pray. To some people, it may seem like 5 prayers a day is an awful lot, but really it only takes about 10 minutes or so. It’s nice to be able to have 10 minutes of PEACE and quiet to myself at intervals throughout the day. Wouldn’t you like to get up and stretch while you’re at work and think about something else for a few minutes? Really, it’s a blessing. After I'm finished praying, I usually read the Quran for a while. Sometimes if there's a wifi signal from the neighbor, I check my email, watch Islamic-related videos online, or do some research. Mohamed bought me 8 little books about different things related to Islam and they are all in English! Finding a book here in English is like a diamond in the rough. I'm very happy he found some and bought all of them for me. Anyway, one of the videos I found is now a favorite on my bookmarks bar. It's a video of a little boy leading the prayer-- which is no small feat. The way it works is that whoever is most knowledgeable is the one who leads the prayer. The prayer leader is called the imam. I'm not sure if this young boy is just a guest this particular day or if he often leads the prayer. To see that he is in a room full of much older men is very impressive. Generally, all imams have the entire Quran memorized from cover to cover and can recite it without error every day. It's safe to say that this young boy has it memorized and is very knowledgeable in Islam or else he wouldn't be leading the prayer. This is such a heart-felt recitation of the Quran and it is really beautiful. It doesn't matter if you're Muslim or not, watch this very short video. It's translated in English so you can see what he's saying. If you have time to be reading this blog, you have time to watch a short video. Please just press play. Later on in the day, it's time to cook. My friends and I have been making some really delicious food to break our fast with. 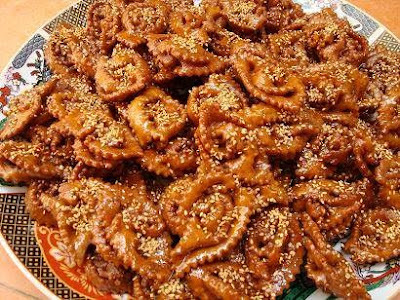 Traditionally, you break the fast with dates and water, but it is not mandatory. I like to have orange juice and luckily you can get fresh, (and I mean FRESH) squeezed orange juice on just about any corner here. The guys will cut them and juice them by hand and refill old water bottles with it. You can get a liter and a half for 20 dirhams, or about $2.00 USD. Here's a little video from where we pulled over to the curb and the guy comes right to the car window. Talk about a drive-through! Much like the early morning athan that signals us to stop eating, the sunset athan called Maghreb signals that it is now permissible to eat. The point of not eating or drinking while the sun is out is so that we are reminded how hard it is for people who have no food or anything to drink--all the time. It's a time where a king is the same as a beggar-- they both fast and pray and are equal. They feel the same hunger pangs and long for a glass of water. Fasting is a reminder of how hard life can be for others and it teaches people to appreciate everything they are blessed with. Some Muslims don't even have dates to break their fasts. Islam teaches us that it is absolutely our responsibility to help each other. How can you eat a big feast when you know your neighbor has no food? It's our duty as Muslims to be kind and generous. If we know the neighbor is hungry and has no food, it's our responsibility to invite him in to eat or at least bring him a plate of food. I mean, how could you not? Before we start to eat, we usually have a glass of water and 3 dates. 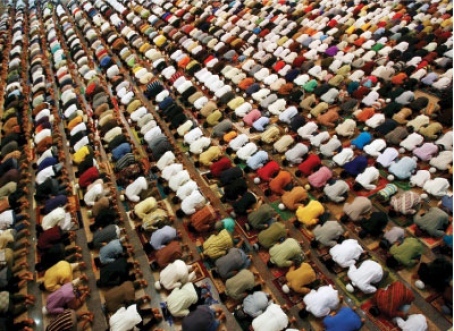 At that point, the men head to the mosque and the women pray at home. By the time the guys are back (about 10 minutes) the table is set and everything is ready to go. 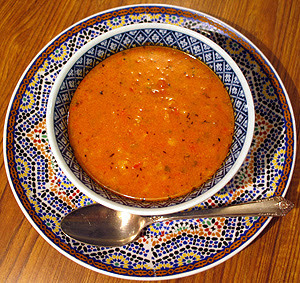 We usually have a modest dinner and it starts with my favorite Moroccan soup called harira. It's a tomato and lentil soup and there are lots of good spices and herbs in it. Another thing that is traditional in Morocco is this really sweet honey-soaked crunchy thing with sesame seeds sprinkled on it. It's called chbykkia and it's pronounced "shBECKY-uh." The spices in the soup and the flavor of the chbykkia go well together. We also make different little tapas and finger foods, which are perfect since our stomach shrink throughout the day and we get full really fast. After dinner, we rest for a little bit and then the athan sounds for the last time of the day. The Isha prayer comes shortly after dinner and many people go to the mosques. They are so packed and full that some of the mosques have the streets blocked off around them with cars parked 3 and 4 deep in the streets. There are parking attendants to help navigate people around and it looks like a scene from a movie where they have all the unoccupied cars in the streets! 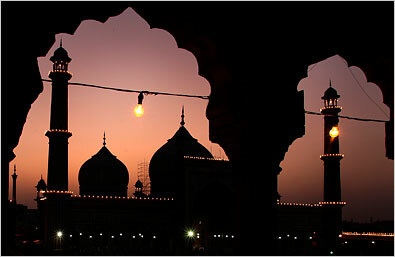 During Ramadan, there is a set of extra prayers called taraweh. The imam recites prayers and it takes about an hour and a half. Throughout the course of the 30 days, the entire Quran is recited in order, bit by bit. For women, it's better to pray inside of the home and even better to pray in the bedroom, but many women opt to go to the mosque to pray along with the imam. Most mosques have rooftops that are filled with women (the men and women always pray in separate places-- often with the men in the main room and the women in the upstairs level). It's nice this time of year because it's warm with a cool breeze and you pray under the night sky. 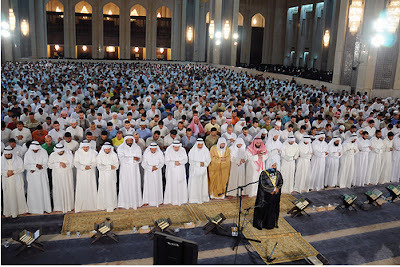 After the taraweh prayer is finished, people return home. Some families eat dinner again, but I choose not to. Usually I am still full from breaking the fast earlier. The last 10 days of Ramadan are a very special time. 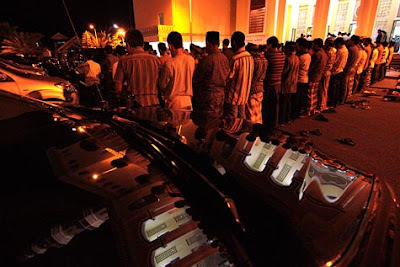 Some people go back to the mosque again at 2:00am-ish and pray what is called qiyam prayer. This is optional and extra, but a looooot of people do this. I prayed a few nights last year, but this year I have not. Mohamed goes to a city called Ait Melloul and comes back at 4:00am just in time for breakfast. Think about it: He sleeps from about 6am-9am then goes to work. When work is done, he comes home, breaks his fast, prays taraweh, eats dinner, then prays the qiyam prayer, all while completing his regular 5 daily prayers at their fixed time. Amazingly, he doesn't collapse. His faith is strong and he is a good example for me of the dedication it takes to be Muslim. We are winding down the last week of Ramadan and I have to say, it's been really amazing. The blessings from Allah are all around us and the atmosphere feels really positive. It's a wonderful time of year and I'm so happy to be in a Muslim country surrounded by all my Muslim brothers and sisters. Ramadan Mubarak. Mashahallah. The month of fasting goes fast! I'm so happy that you've had such a blessed time with a good man. Truly, when you are married to an observant Muslim man, the time is eased. Alhumdulillah. My guy has suhour ready for us so I have to go. Love to you and yours! i spent my ramadan & now my Eid here in morocco. and ive loved it. im very lucky to have observant and faithful muslims in my family & my fiance's family. people think you would lose weight during Ramadan, little do they know thats when you gain the most weight. loooool in the states, for sure. it is harder there. what has been your favorite parrt? mine has been the samba guy who comes around to let people know it is time for suhoor. i really wished i videotaped it beause he was my favorite. Wish your husband a beautiful Eid, and I wish you more love and happiness. Absolutely love your blog !! Keep it going, Mashallah, you got married within your two years in Morocco?